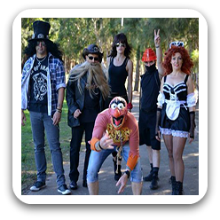 Sydney Band 713 – Many people agree that some of the best music is from that great retro era of the 70’s, 80’s and 90’s. Where the girls just wanna have fun as the guys blame it on the boogie. What a feeling as you shake your tailfeather to some hot stuff and you know I will survive cuz it feels like I’m walking on sunshine. Turn back time with Cher & show us your best cheer moves with Toni. Some of Sydney’s & the Illawarra’s most experienced musicians who have played together & in many other bands both nationally & internationally for years, have banded together to give you a fun filled night of entertainment with a look back at some of the greatest hits from the 70’s, 80’s and 90’s. Expect plenty of crowd involvement where you get to wear the hats, wigs & sing into those big microphones with your favourite stars from that era. Perfect for your venue, corporate functions, parties, celebrations, anywhere you want a fun filled night with quality musicians. Sydney Band 713, simply the best of the 70’s, 80’s an 90’s. 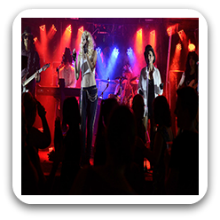 Can perform as a: 3, 4, 5 and 6 Piece Band and are available to perform in Sydney and Surrounding Areas.